Air fresheners are a very important part of a caretaker, housekeeper or janitor's duties, as well as being an ever-present in many domestic homes. 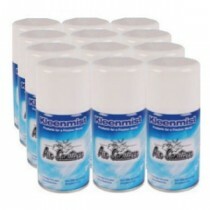 From quality brands including Selden, Kimberley Clark and Clover Chemicals, we stock aerosol fresheners for the home, and concentrated liquid fresheners for professional cleaning application, as well as battery operated dispensers for timed and measured spurts, ideal for use in public washrooms. Call us on 01923 839039 to discuss the best solution for you.